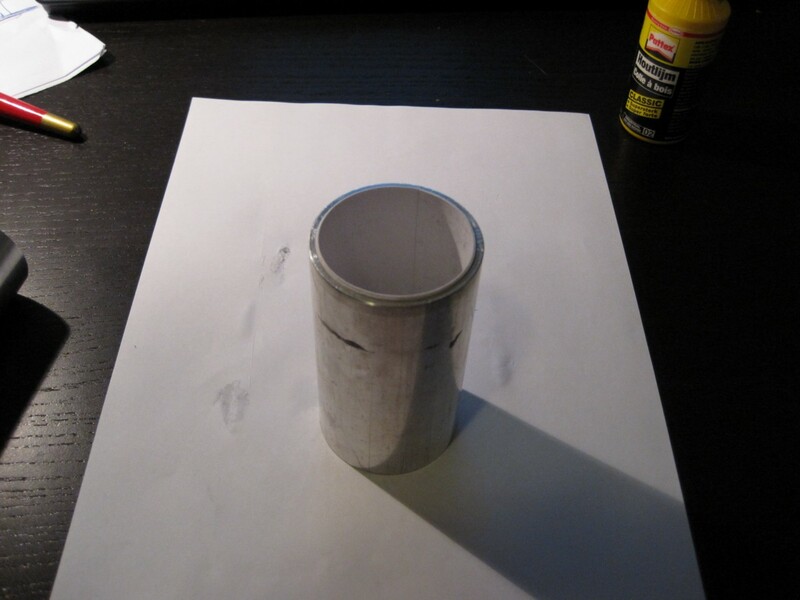 Making the inhibitor I use two templates made out of 1,5mm thick aluminium sheet metal. 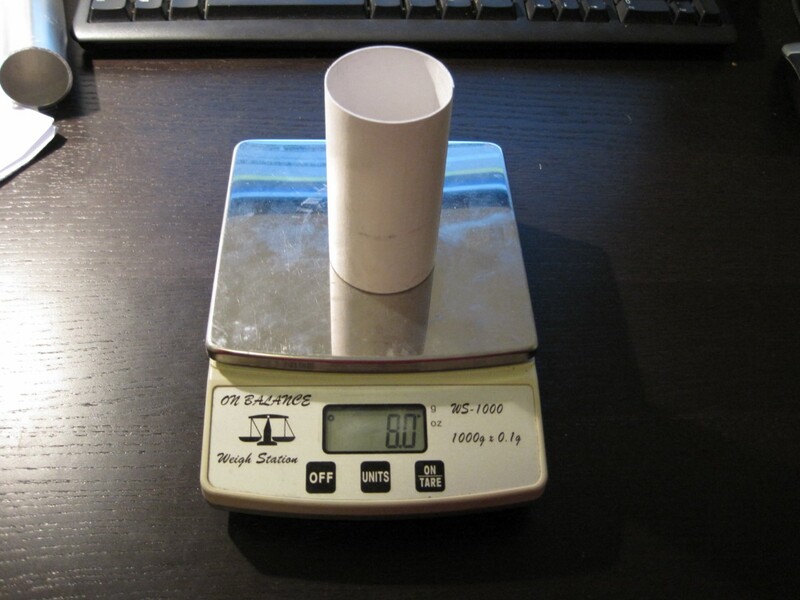 One of 360x90mm and one with 300x90mm. 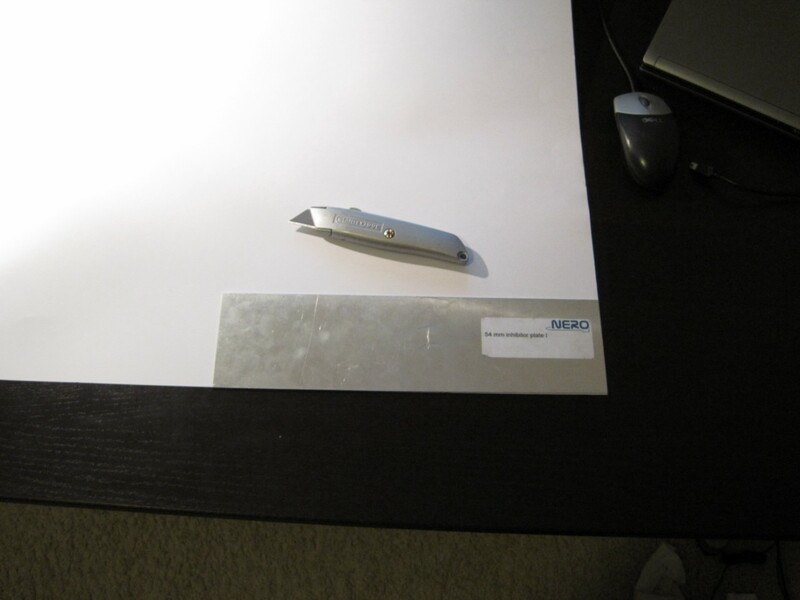 The larger one is used to cut out the inhibitor from the cardboard. 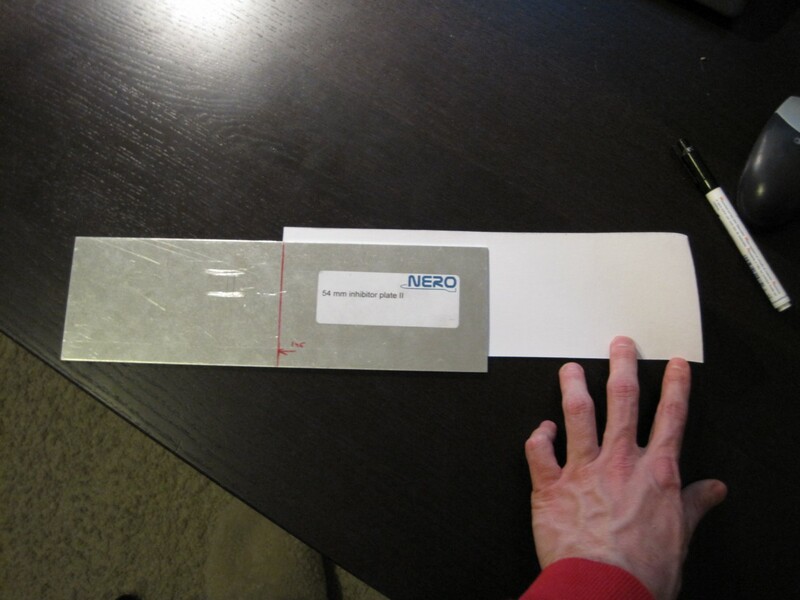 Pull the cut paper, typically 0,4mm thick, a couple of times over a sharp square edge, for example I use a 20x20x2mm aluminium angle profile on my desk. 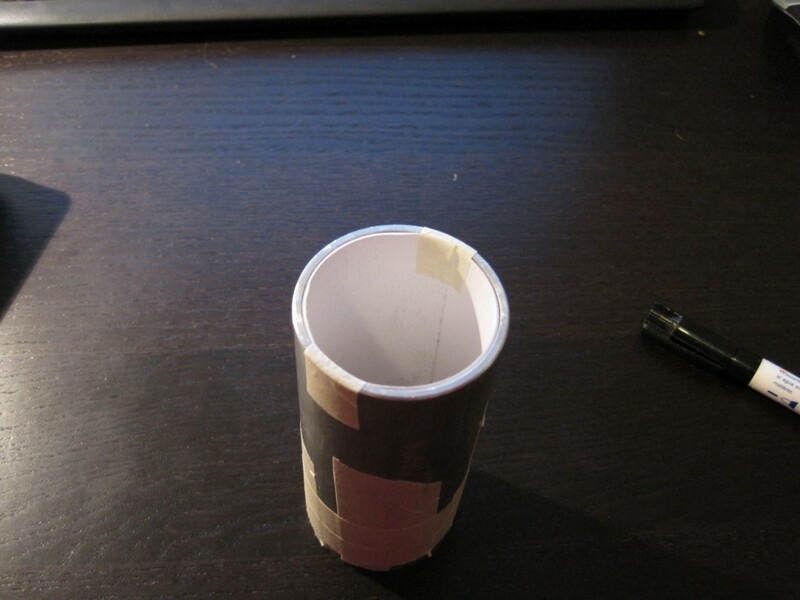 After this the cardboard will have a curl but not all the way to the ends. 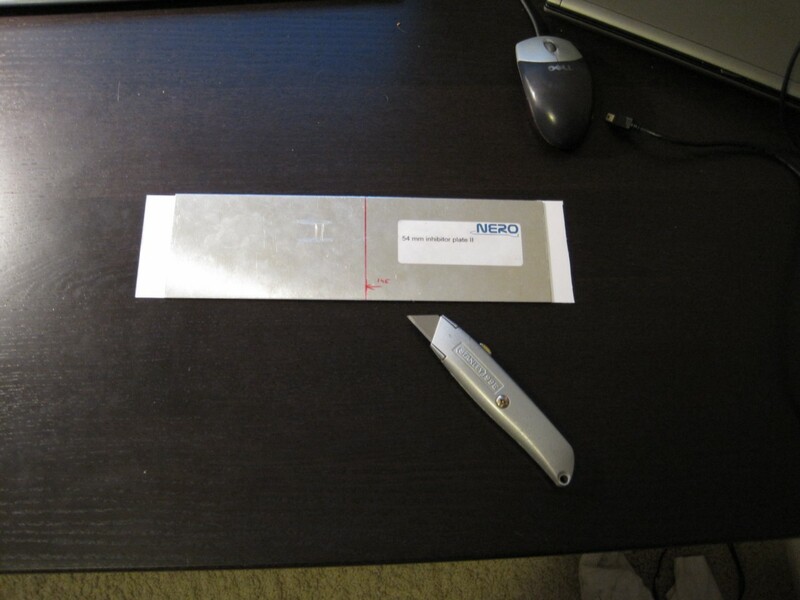 Use the smaller template to cut the inhibitor to its final length removing the uncurled sections at both ends. The inner side of the inhibitor which is in direct contact with the KNDX + 10mm overlap is not coated with white glue. 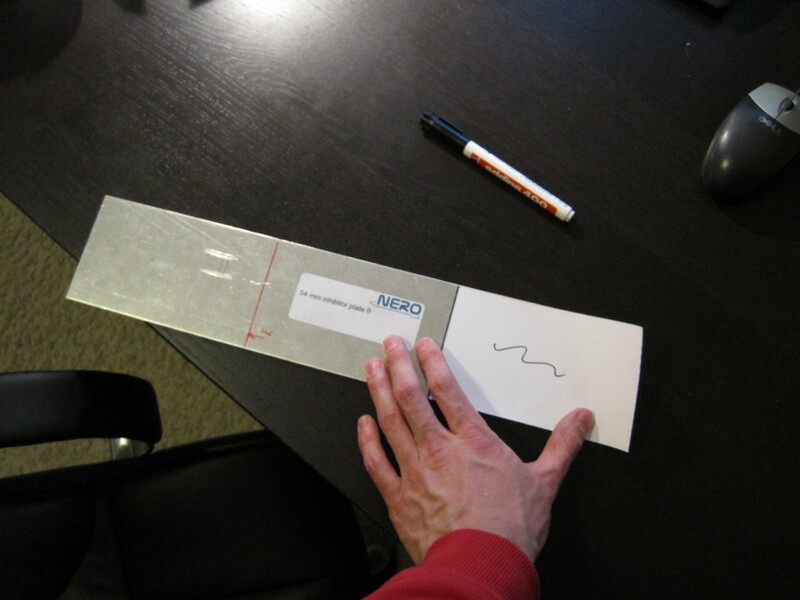 Use a marker to draw a line were to apply glue and where not. 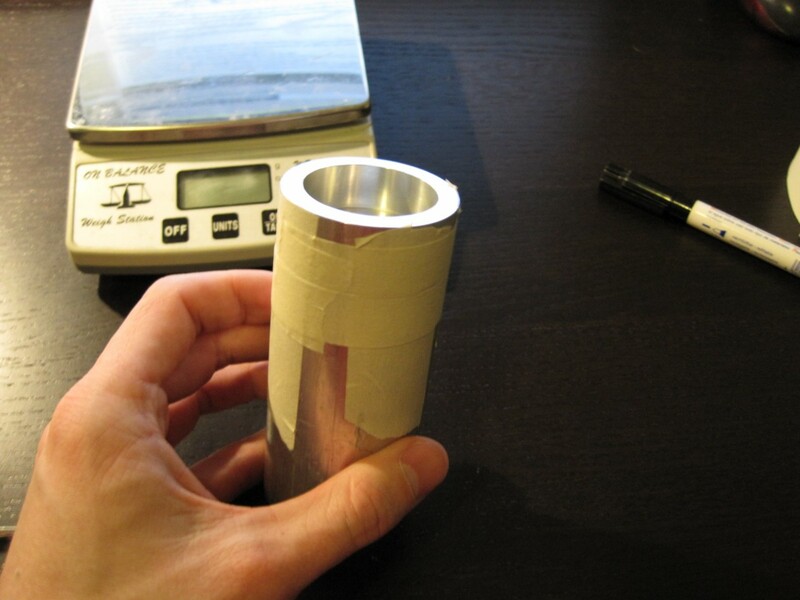 Tightly pre-roll the inhibitor over a pipe with a OD of 44mm and carefully align the edges wile rolling. 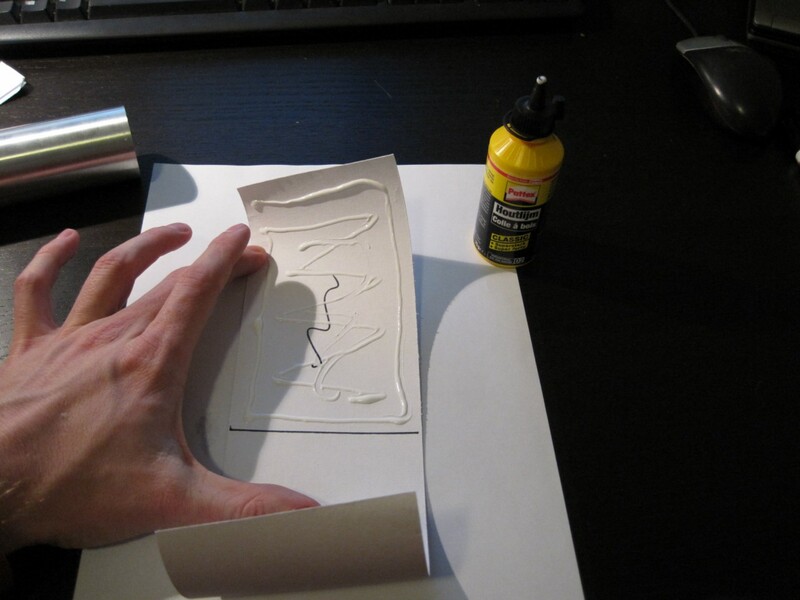 Use a short haired brush and apply a thin layer of white glue on the designated section. 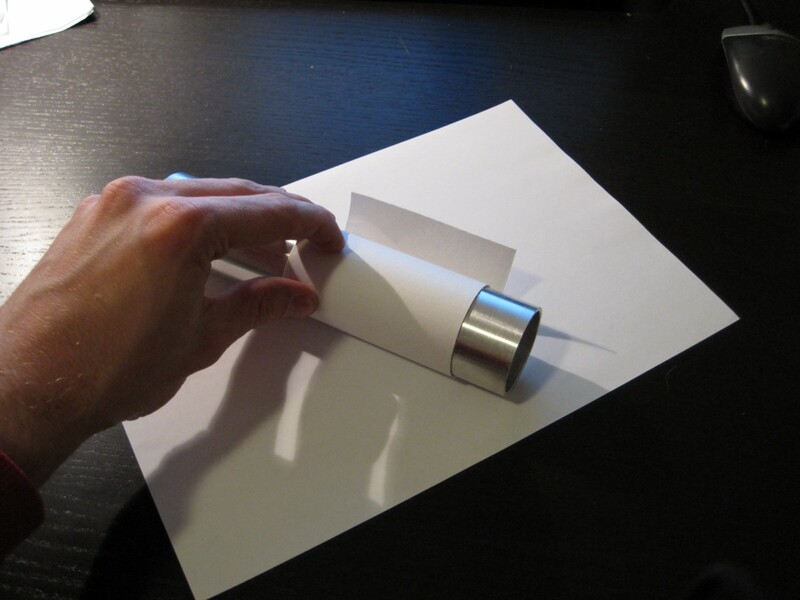 Roll the inhibitor over the pipe and once again carefully align the edges. You will only get one shot at this. If the alignment is off by 2+mm just throw it away and start over. 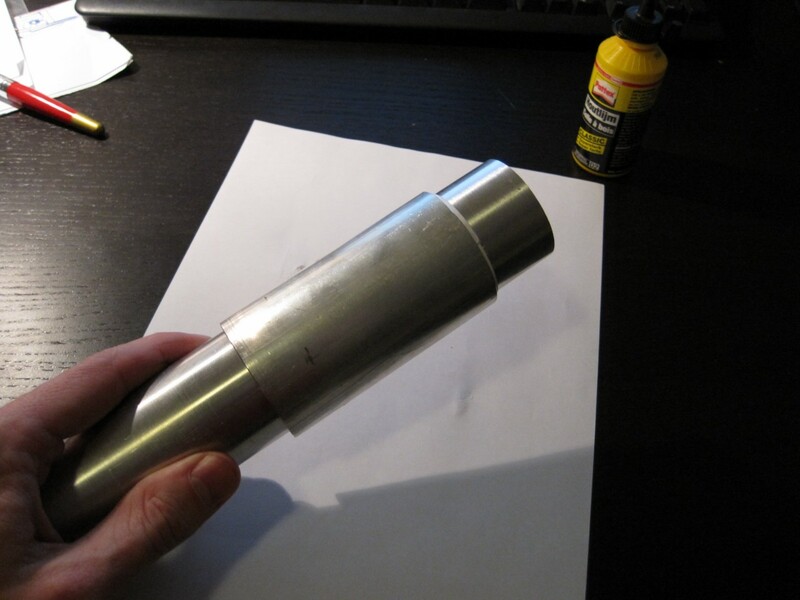 To finish the inhibitor: put the casting casing (aluminium pipe 50x46mm – length 90mm) over the inhibitor, remove the core pipe care and allow to dry above a radiator or oven for a couple of minutes. This is where you can find the drawings of the casting stand. I use a spring to get the optimum density, good inhibitor bonding and as-cast dimensions of the grain without the need to machine them to the final dimensions. Best piece of equipment ever bought for melten candy: Princess 162367, Classic Multi Wonder Chef Pro & Princess 162467, Classic Multi Wonder Chef Medium. Insert the pre-made inhibiter with the best aligned edge into the casting casing. Add the base to the square inhibitor edge and secure the base with good A-quality 30mm wide masking tape (don’t use the cheap kind or the glue will stick). Two longitudinal tapes + one around the perimeter of the casing. This will keep the base attached to the pipe but more over to prevent the DX from being extruded out of the small gap. 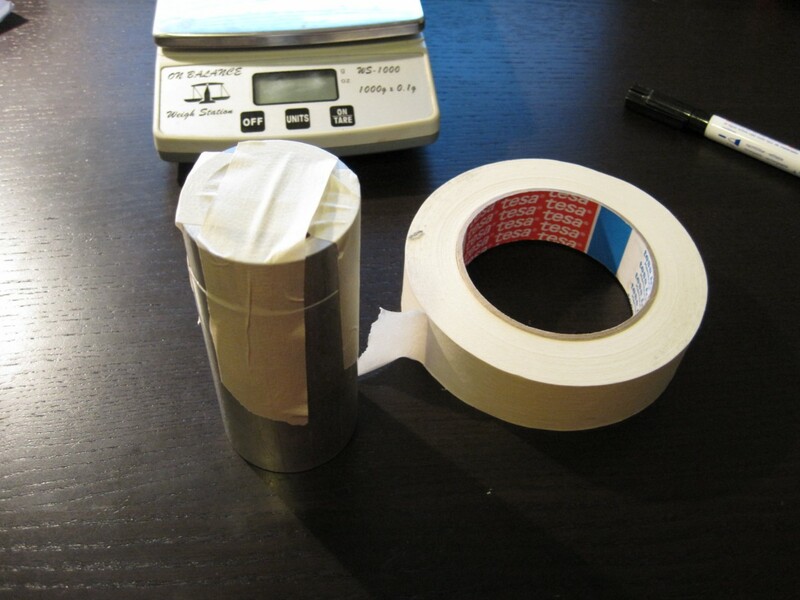 Also tape the top side of the inhibitor with a 30x10mm strip to the casing so the inhibitor cannot crawl upward. Put the top closure in the freezer, at a later stage this will prevent the KNDX from sticking to it. Tighten the lower nut and washer on the coring rod and coat the Delring coring rod + the surface of the base exposed to the KNDX with a thin layer of WD40. Probably any oil will do and olive oil seems to work just as fine. Put the assembly (base taped to casting tube & the coring rod inserted) into an oven set at 80-100°C. 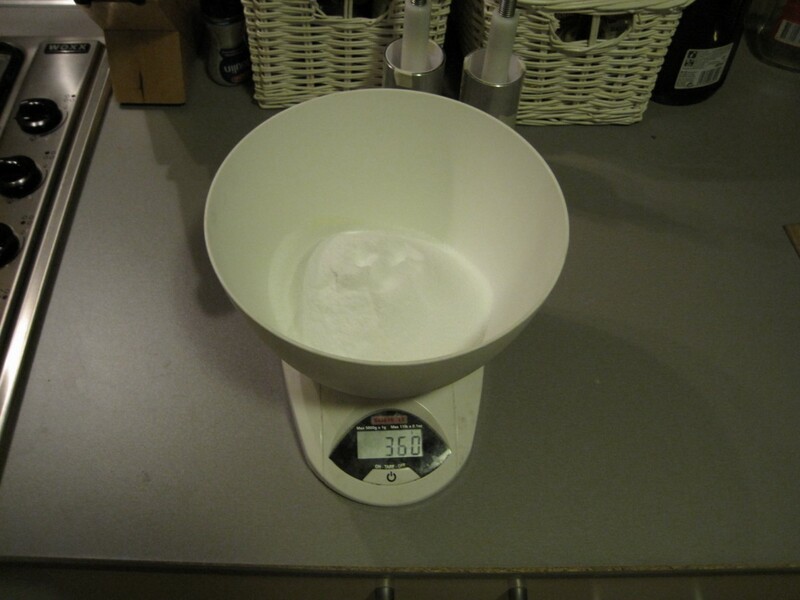 For 2 grains, weigh out the right amount of KN & DX in a bowl: 234gr KN + 126gr DX = 360gr KDX and mix / blend thoroughly. Use an electrical pan – make Princess, Classic Multi Wonder Chef Pro – (set at 2/3 of the 165° mark) to heat approximately 100gr KNDX. 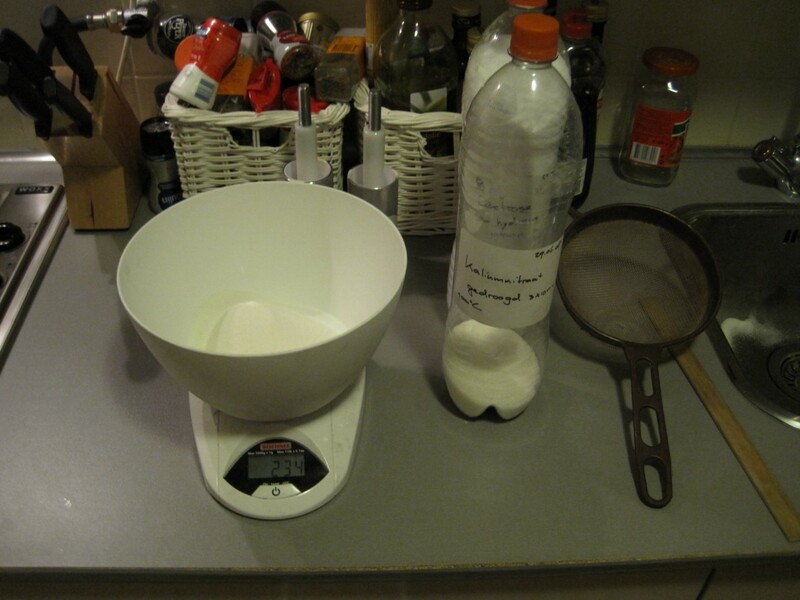 Continue to add 100gr at a time until the whole batch is fully melted. The KNDX will go to yoghurt consistency. Stir every now and then. If caramelisation ocurs set the thermostat at a slightly lower temperature and stir. Also swirl the batch a bit to the side where the pouring will take place to heat the edge of the pan. Keep the KNDX molten for 10 min so some of the enclosed air can escape thus improving the density to start with. Normally around 90% of ideal. 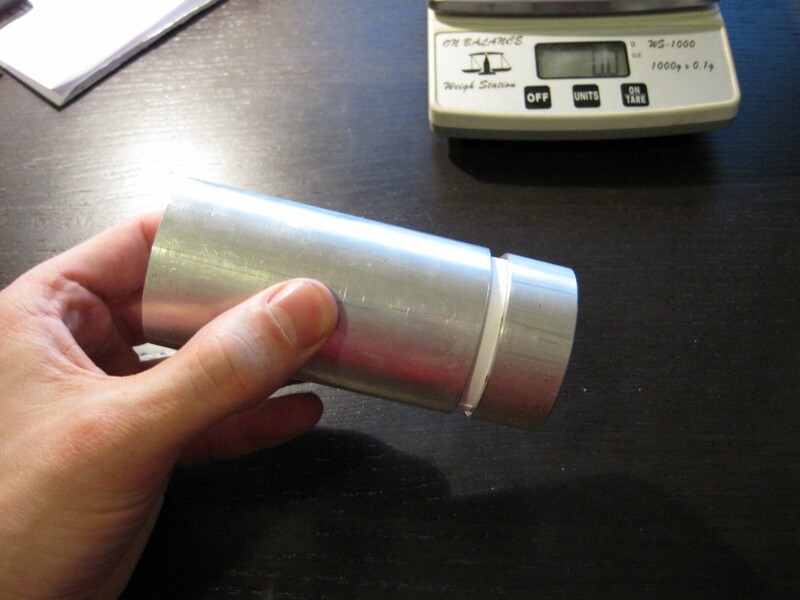 Place the pre-heated casting mould on a digital scale (1gr accuracy is sufficient) and set the scale to zero. 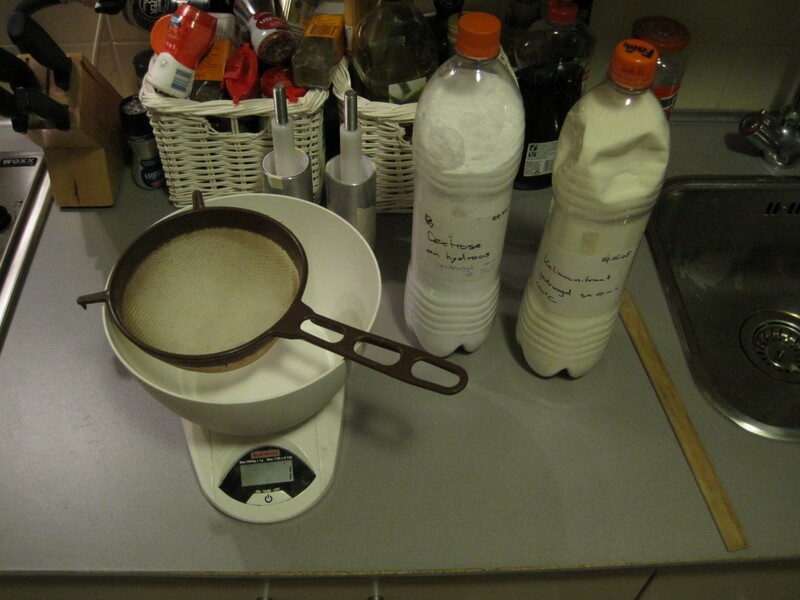 Pour the melted KNDX slurry in the casting mould until you have added 149gr (147 ideal + 2gr for small loss during casting) of KNDX propellant. 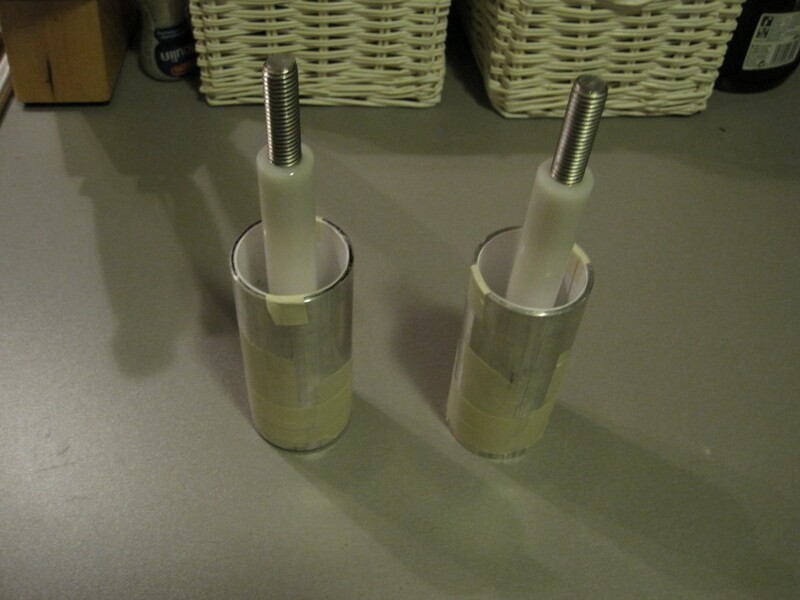 Get the top closure out of the freezer and, if the case, push the propellant down along the coring rod. It might be necessary to perform this operation during step 10 to create more space for pouring in the propellant because of the low density of the molten KNDX. 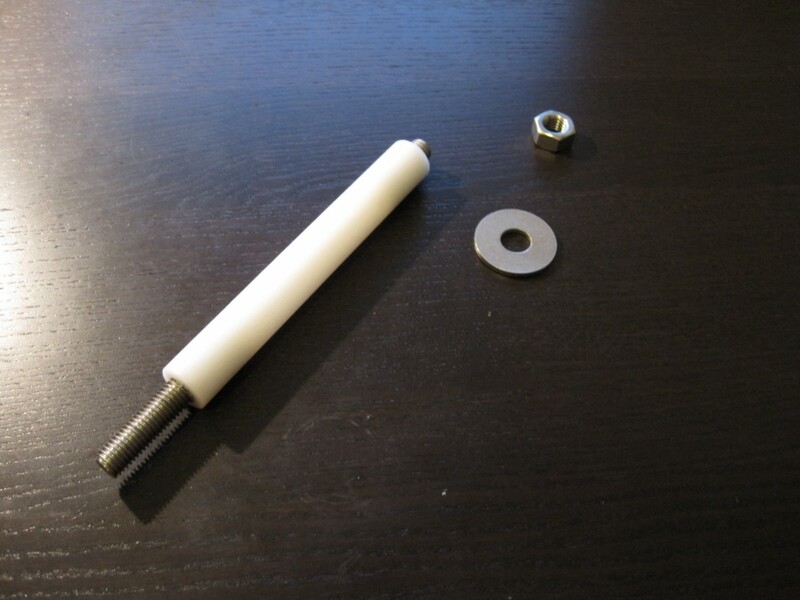 Slide the spring, pusher and washer on the coring rod and tighten the nut. Tighten the nut but never close it in such away that the space between the spring coils are closed. Let the spring work to compress the KNDX. After the spring has released some of its tension you can tighten it some more until it reaches the coring rod and turn back ½ a turn. You can actually hear the air escape in small bursting bubbles as you tighten the top nut and compress the spring. IMPORTANT NOTE: “The reason to you need some distance between the coils of the spring is that in such a situation you can never compress the KNDX then the spring can actually apply. In my design it does not let you ever over compress the KNDX because the nut will run into the delrin when the thread runs out. 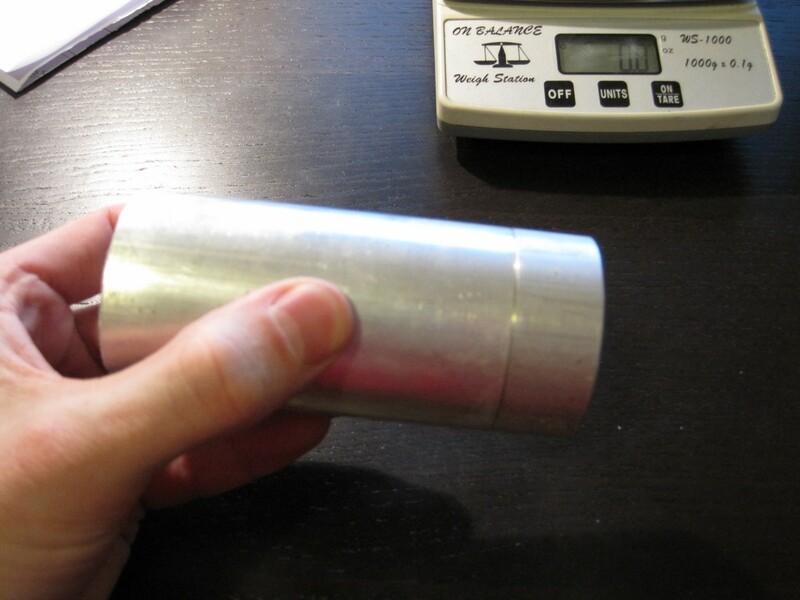 But in a poor design or when you ignore this warning: when tightening the nut you might already have reached the optimal density (100%) and you are still tightening the nut and compressing it more. That is just disaster waiting to happen. 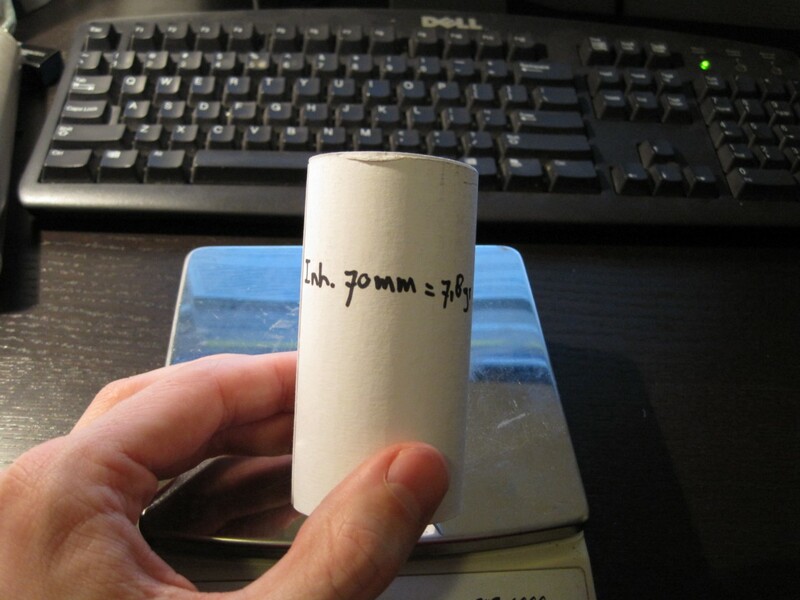 weigh the grain on the digital scale and write with a permanent marker: date, nett inhibitor weight, length of propellant, nett weight and calculated density on the outside. Later add on grain number. Lay out / stack the 4 grains on the liner and use an empty inhibitor to fill up the free space at the top. This will prevent the grains from moving when static testing the motor nozzle up. 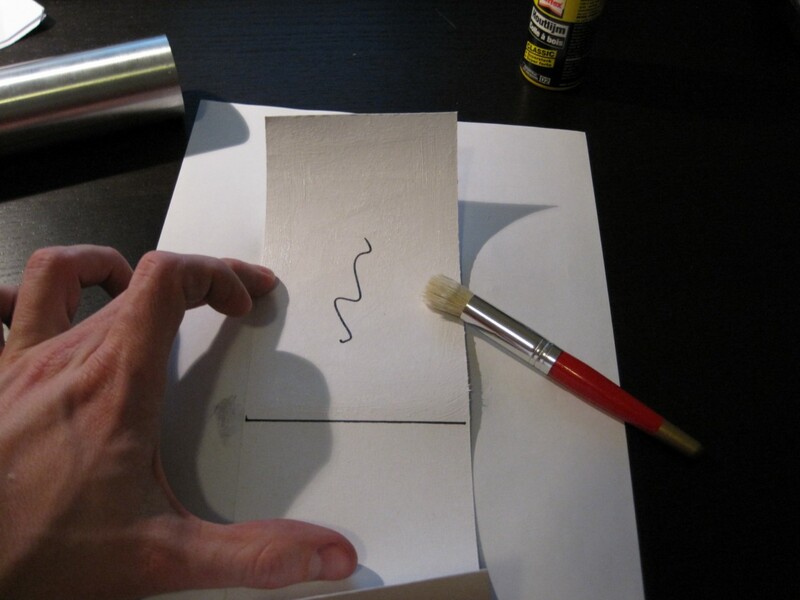 Add a line with a marker and cut with a pair of scissors to length. Optionally the inhibitor can be filled with KNDX + red iron oxide to make a make grain. 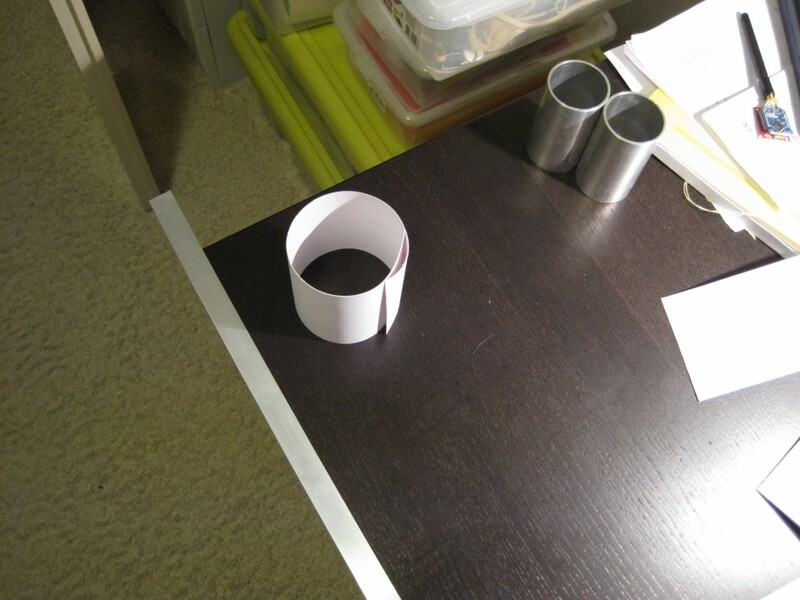 Now cut 5 stripes of aluminium tape approximately 10x40mm. Wrap the liner around the grains and insert the assembly in the casing. Align on end of the liner with the casing and add a strip on the outside of the longitudinal edge of the overlap, flip it over the edge of the liner to the inside and use your nail to make a sharp edge at the overlap (long discription of a very simple action). Now pull out the liner including the grains bit by bit and add an additional 2 strips every +/- 80mm. Not longitudinal but square to the edge. Slide back the liner including the grains and repeat step 5 at the other side of the casing. 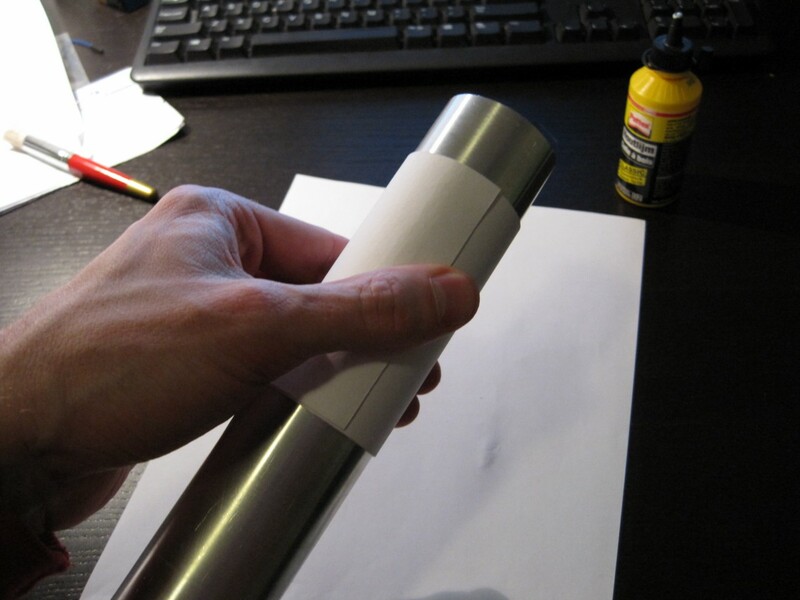 Make sure no crease are present and the liner slips in and out of the casing without force. 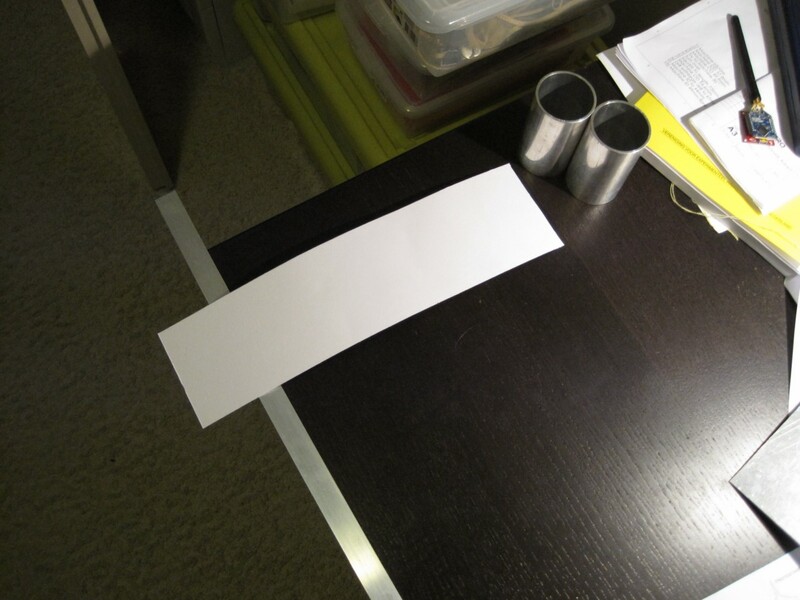 Now tape the aluminium tape over the full length of the overlap and cut to length. Again, use your nail to make a sharp edge at the overlap.